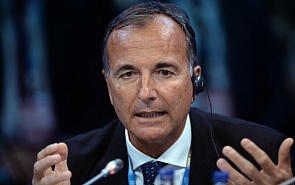 In an exclusive interview with valdaiclub.com, former Italian Foreign Minister Franco Frattini discusses the decline of European unity, the policy of sanctions, and the crisis in Venezuela. The situation within the European Union is very bad, and there are various factors of crisis. First, given the situation in London, there are difficulties with the agreement on Brexit. We all know what is happening in the British Parliament, and about the problems of Mrs. May. She demands to renegotiate the agreement, while the European Commission says that is not possible. Henceforth, there is a real possibility to have a no-deal solution for Brexit, and this could have a serious impact on both the UK and the rest of Europe. The second factor of crisis is the tensions between the European Union’s “founding fathers” group of countries – primarily, between Italy and France. That is the decision of France to withdraw from consultations following the imprudent decision of Mr. Di Mayo to meet in Paris with the leaders of violent protests who were devastating the city and attacking the French Republic. France has also been making a lot of mistakes vis-à-vis Italy. Deputy Prime Minister Salvini is right: during the worst moments of the migratory crisis, France did not help Italy. It decided to close the ports of Marseille and said that it does not want to take any migrants or refugees, while we were under a heavy pressure. France has to make what we used to call “mea culpa”. Italy-France: Age-Long Rivalry or a Fault Line? Politically, Franco-Italian rivalry in the Mediterranean is a major problem. The Mediterranean is a foreign policy priority for both states, but Italy has been recently losing this battle to France. The latest example is Libya, where Italy was against a military operation up to the last possible moment. Rome’s interests have been seriously affected by instability in the region, in particular in Libya. The third factor of European problems is the reaffirmation of the Franco-German bilateral axis. Berlin and Paris intend to dictate to the rest of Europe what they should or should not do. Recently, there was a meeting in Aachen, where the two leaders, Macron and Merkel, reaffirmed the principle that Germany and France should prevail big countries like Italy, Spain or Poland, which is unacceptable. The last factor is the divisions we have on many issues of international and security policy – particularly, on the sanctions against Russia. Many countries in Europe profoundly support the sanctions-based policy, while Italy, Austria, Greece, and maybe Hungary, consider them completely negative, which causes a division. There is also a division on energy security, because for Italy or Germany it is not a problem having a trans-European pipeline coming from Russia, like Nord Stream-2. Other countries, like Poland, are furiously against it. Because of all these reasons, European Union is passing through harsh times. Moreover, due to the European elections coming, tensions and frictions accentuate. The Italian government is right that Europe has to protect, to promote, to help, not simply to dictate bureaucratic rules. But what we see is mutual distrust on migration management, since Italy was deeply affected by the refugee crisis and abandoned to face the crisis on its own. Other Europe countries said, “OK, that is not my problem”. That was a terrible violation of the basic principles of solidarity written in the treaties. So the government of Italy and Mr. Salvini were obliged to close the ports in order to find a solution. Otherwise, solution would not have been found, as it was in the past. Then, everyone said, “OK, Italy is right, but it is not in my backyard, I do not want to take any migrants, any refugees, although I recognize that Italy is right”, – but we do not need words, we need concrete actions. The migration crisis in Europe was much more severe two or three years ago. Back then, Angela Merkel, the leader of Europe’s strongest country, made a mistake by trying to solve the problem in liberal ways. Later, she tried to backtrack, but policy reversal was slow as she feared losing face. Hungarian premier Viktor Orban was the only European politician who said it was a mistake and that Europe must defend itself from the influx of migrants. Henceforth, we want the rest of Europe to be occupied with the problems of ordinary people, not the bureaucratic problems of the so-called “elite”. In Europe, we do not have political leadership. The European Commission is very weak and unable to see that the sanctions-based policy hurts Europe much more than Russia. We do not have to pay the price because of decisions taken in Washington by Obama and then reconfirmed by Trump. If you ask the Italian Association of Enterprises, they are all paying the price because of the sanctions, while Russia is recovering its agricultural and other sectors. One must be sure that Italy will never leave Europe or Eurozone. However, we want to change the system, because the system is not democratic and still not yet political-oriented, and we do not have a leadership. While the European Parliament election campaign is on the run, it is very difficult to get any concrete results. Until the end of May, it is difficult to envisage results like cancelling or lifting the sanctions, or restoring the policy of sharing the burden of taking refugees. For the elections, all domestic political problems are an obstacle. Will We Face A Different Europe? Europe is changing before our eyes. What seemed impossible just a few years ago hardly surprises anyone now. The question is where these changes will lead the project of European integration as such and what they will entail for Europe’s neighbors. Russia has grown very tired of the European elite it has had to deal with in the last few years. After the elections, the European Commission will surely be different. There will be more MEPs who want to change Europe, so it will be more business-oriented. Later this year, during the discussion on the EU’s budget, Italy will insist on adding more money on preventing migration – for example from Africa. This point is a very concrete one. The European fund for Africa is less than one billion euros, which is a small amount of money. Therefore, we have to have more money to prevent immigration, to protect our external border, and to protect small and medium enterprises. With regard to Venezuela, Italy’s point of view is similar to the one expressed by Russia. But my personal opinion is that it is impossible to go ahead with President Maduro in office. And Russia could be the best force to negotiate on the new presidential and new parliamentary elections, since Russia has historical, political, and economical influence on Caracas. As it was in the Middle East – in Syria, Libya, and Egypt, Russia could play a key role as a global player. ﻿﻿In a country ravaged by a humanitarian crisis due to the unprecedented lack of capacity by governing actors to adequately manage the world’s largest proven oil reserves, the political confrontation is intertwined between domestic, regional and global interests. With the help of Russia and Latin American countries like Brazil and Argentina Venezuela could hold elections without regime change imposed by Washington. I do not know if Russia is thinking about taking a political initiative like that, but the status quo is horrible and this situation has to be stopped.